Are you looking for an alternative to surgery to treat your uterine fibroids? There are a variety of treatment options for these noncancerous growths of the uterus, and before you make any decisions on what course of treatment is best for you, you should know that surgery is not your only option. Uterine fibroid embolization (UFE) uses beads to block the blood supply to fibroids. If you think UFE may be the right choice for you, discuss UFE in detail with an interventional radiologist, a physician trained in the use of x-ray technology to perform procedures. 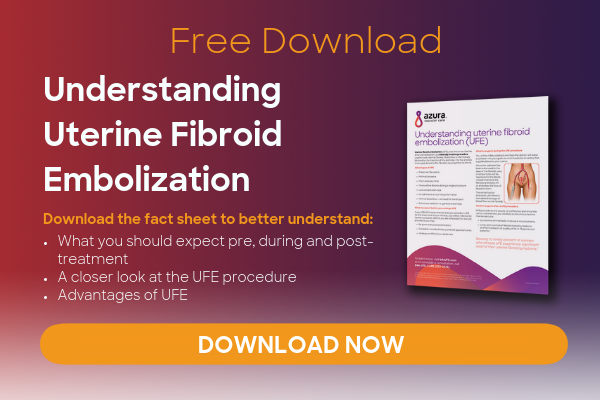 Together you can determine if UFE is a potential option to treat your uterine fibroids. Uterine fibroid embolization recovery typically takes about 1- 2 weeks. You may have some cramping that is usually the worst 2 – 6 hours after the procedure. The cramping is typically treated with pain medication. [i] The next 4 – 5 days may also include some mild cramping, fatigue, and possibly nausea and/or a fever. Most women are back to normal activities, such as work, school, and family activities within 7 – 10 days. [ii] This is much faster than the standard 6 weeks it takes to recover from a hysterectomy, a surgery to remove the uterus and possibly the ovaries. Because UFE is an outpatient procedure and does not require an overnight stay in the hospital, you should be able to go home and sleep in your own bed the same day as your procedure. After a hysterectomy, women need to stay in the hospital for at least one night. 4. UFE is Recognized by the American Congress of Obstetricians and Gynecologists. With UFE, the interventional radiologist makes a small nick in the groin or wrist to place a catheter in the femoral or radial artery. This small cut, covered by a bandage when you go home, should heal without leaving a scar. Because the procedure is performed within the blood vessels, there should be no development of scar tissue within the abdomen, as can occur with hysterectomy or myomectomy. During UFE, the interventional radiologist can treat all of the fibroids during one procedure. Using imaging technology the interventional radiologist can visualize the blood flow to a particular fibroid and target the beads to that specific area. If there are multiple areas to treat, the position of the catheter can easily be adjusted. UFE treats fibroids by blocking their blood supply. With UFE, your uterus is spared. This is different from other surgical treatments for fibroids such as hysterectomy. Even with myomectomy, the tissue of the uterus may need to be cut to remove the fibroid. There are a lot of reasons to consider UFE to treat your fibroids. If you think that UFE could be a good fit for you, you should find a vascular specialist who uses UFE as a uterine fibroid treatment. iii Mara, M. and K. Kubinova, Embolization of uterine fibroids from the point of view of the gynecologist: pros and cons. Int J Womens Health, 2014. 6: p. 623-9.
iv Spies, J.B., Current evidence in uterine embolization for fibroids. Semin Intervent Radiol, 2013. 30(4): p. 340-346.
v Torre, A., et al., Uterine artery embolization for severe symptomatic fibroids: effects on fertility and symptoms. Hum Reprod, 2014. 29(3): p. 490-501.